Those who pay for medical supplies or services will want to make sure that they obtain a record of their transaction. So the seller or provider of these medical-related goods and services will need to issue a documented receipt. This article will teach you all that you need to know in order to properly make one. The receipt should always have information on the medical company that is responsible for issuing it. Aside from the company’s name, you should also consider the logo design that you will be placed into the receipt. 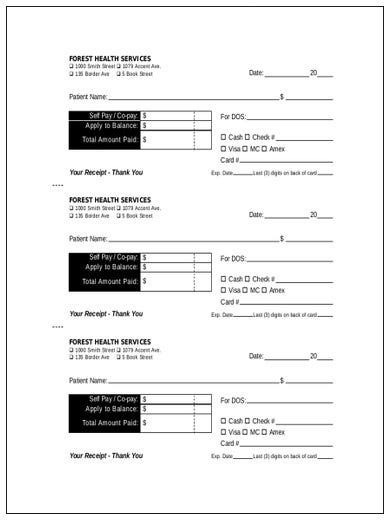 Do not forget to include the contact information that patients, both current or former, can use to contact the company. Now comes the part where you will need to put in information on the person that is meant to receive the receipt. Make sure that you are able to include important information such as the complete name of the person, his/her current address, contact details and anything else that may be required. The dates that you will be placing here will depend on the situation. 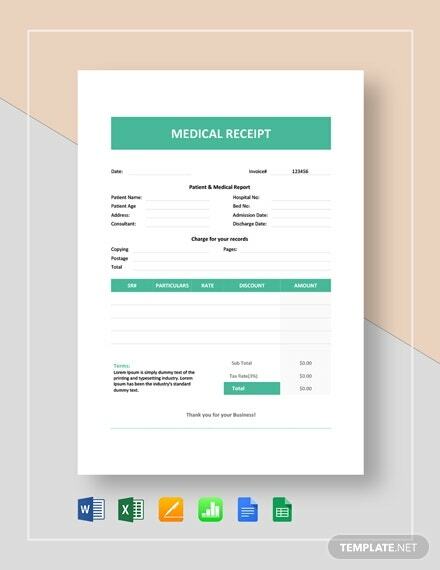 If it is a receipt that is to be provided after the purchase of medical goods, then just put in the date in which the transaction took place. If it was a receipt made to a medical service, provide the date in which the patient was admitted and the date he/she was discharged. This is the part of the receipt where you will need to list down all of the different items that were paid for. Take note of all the different goods or services that were provided as you do not want to charge the payee with more or less than the actual total price. Now that you are done listing down all of the different items that contribute to the total amount that needs to be paid, you still have to make sure to provide information on the individual prices of each. Make sure that each figure you provide is accurate as this will factor into the total amount. Once you are done listing down the different prices for each item that needs to be paid for, then you simply need to total everything. Make sure to include any additional costs and taxes as those will factor into the final amount. Also, point out how the recipient of the receipt will pay for everything. When a medical company provides you with medical-related goods or services, then you should expect to see a statement that contains just how much you will need to pay. 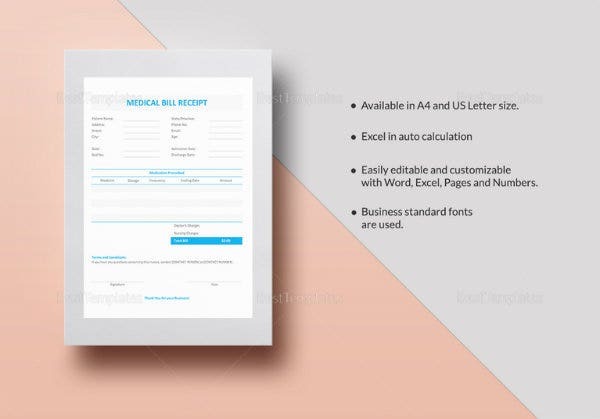 If you are in the position to provide this information, then you will find the most use out of downloading this medical bill template. Those who are in charge or providing medical goods and services will also need to supply a document which shows that the total amount that needs to be paid. If you find yourself in a position wherein you need to do this, then use this template to help make the very receipt that you need. 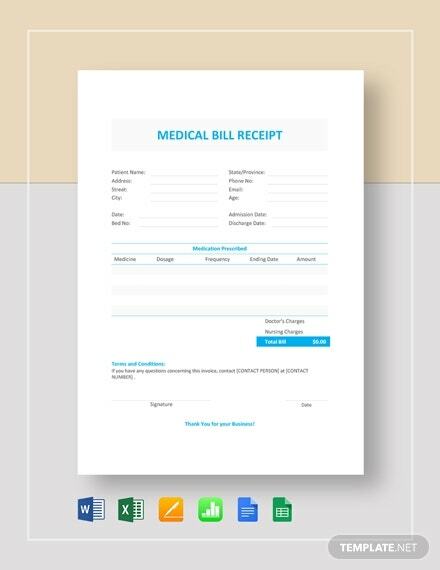 If you are having trouble coming up with a medical bill receipt, then you always have the option to download and make use of this template. The moment you have it, all you have to do on your end is to make sure that the receipt has all of the information it needs. No matter what kind of medical goods or services you provide, you still have to make sure that the details concerning costs are provided to the person that needs to make the payment. 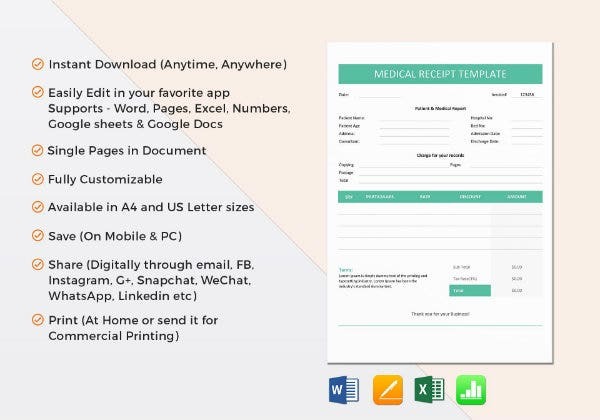 With the help of this medical receipt template, you will definitely be able to share everything that the paying party will need to know. 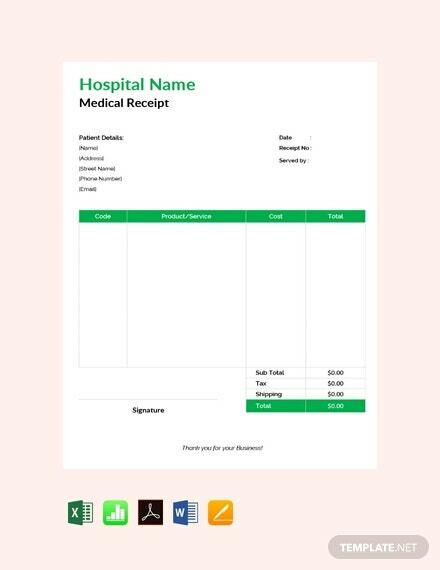 If you are planning to come up with a receipt but you want to make it in a manner that’s both free and easy to do, then look no further than the template available here. You can use programs such as Microsoft Word, Apple Pages, or even Publisher to access and customize it until it has the information you want it to. It cannot be helped that there are some people who will require medical services. When the time comes that they need to pay for what has been provided, then you’ll find that this template will be very useful. Use it to make a receipt which provides details such as the type of medical services rendered and how much needs to be paid.